If you are looking for a portable solar power solution look no further than the Sunshine Compact range with unrivalled performance. Unlike other similar folding solar kits that have the solar regulator stuck on the back of the solar panel exposed to the elements and too far away from the battery to effectively monitor the state of charge, the Compact range's solar regulator is positioned in the dry close to the battery for maximum performance and reliability. The Sunshine Compact 40W Solar Power Kit benefits from a fold-able design. The kit comes complete with everything needed for quick easy set up and safe charging of 12 volt batteries of all types. Perfect for Caravans & Motorhomes when running on battery power only. 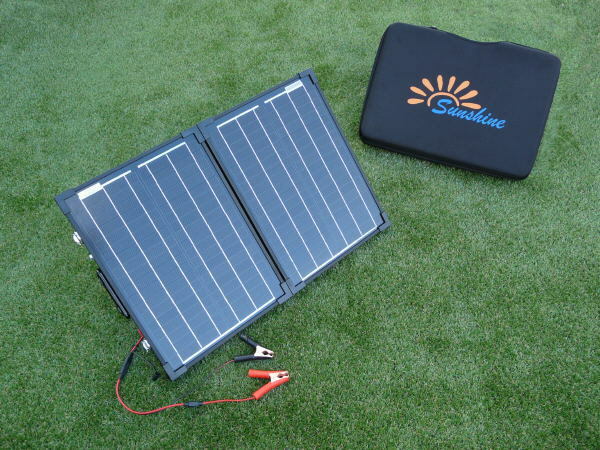 The Sunshine Folding Power Kit comprises of two robust 20W solar panels linked together by cables and hinges, attached to each panel is a fold-able adjustable stand. The charge regulator supplied insures the battery is protected from overcharge and over-discharge at all times.